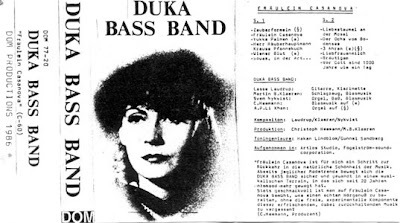 Duka Bass Band appears to be a trio consisting of Lasse Laudrup, Martin B. Klaeren and Sven Nykvist. On Fraulein Casanova, they are joined on a few tracks by Christoph Heeman and Achim P. Li Khan of HNAS, and Heeman also produced the album. The Duka Bass Band's sound is a fuzzy, primitive clamor of clueless post-jazz improvisations that meander aimlessly and appear to fly in several different directions at once. It has a certain amateurish quality and a creepy subterranean feel that appeals to me, although I couldn't say exactly why. In the exclusively German liner notes, Heeman muses "Fraulein Casanova is for me a jerking step forward into the natural alreadyness of music." Perhaps this dodgy AltaVista translation should not be trusted, but it's as good an explanation as any for the oddly surreal free playing on display here. The opening track is the seven-minute "Zauberformeln," which means 'magical formulas.' It's an apt description for the mysterious forces that transform the sound of deficiently played clarinet, organs and drums into a strange alchemical gold that is more than the sum of its components. There are moments throughout Fraulein Casanova that touch on elements of fire music improvs, belabored Shaggs-style guitar, and in the case of the last track (whose title loosely translates to "For God, 1000 Years Is Like a Day"), a ramshackle psych-folk jam not dissimilar from the recent work of Sunburned Hand of the Man. This is my personal favorite of the six bootlegs, and I look forward to further recordings by this mysterious post-industrial jazz trio materializing at some future point.